Ball exercises are great for the weightless sensation and ease they can be done, but also for the amazing body benefits they provide. It’s also a lot of fun working out with a large vinyl air-filled ball. Many people connect to a ball much easier than to a machine. It is difficult to find one exercise machine that will tone and strengthen so many areas of your body like you get with the help of an exercise ball. The beauty is that these vinyl air filled balls are inexpensive, don’t take up much room, can be easily purchased and are portable. But before you jump in, make sure you choose an exercise ball that is right for you. Click here to get more information on How to Choose the Right Exercise Ball. Begin in a seated neutral position. Walk feet out in front allowing the ball to roll underneath your spine. Tighten abdominal muscles to curl up slowly while lifting shoulder blades off the ball. You can vary arm position to alter intensity. Breathe out while contracting your ab muscles and breathe in while returning to starting position. This exercise mainly targets the upper abdominal muscles. It also works the hip and core muscles. Rest your body (trunk) on the ball with your hands and feet on the floor for support. Slowly lift opposite arm and leg up to body height only. Maintain a neutral position with neck and spine in alignment. Lower and repeat with the other side. Breathe out while extending and breathe in when returning to starting position. This exercise will target both the upper and lower back muscles as well as your buttock and hamstring muscles. Lie on your back and place the ball between your legs just below your knees. Then squeeze the ball by bringing your thighs closer together while lifting your buttocks off the floor. Take a moment then slowly release pressure. Keep your back straight at all times. This exercise targets your inner thighs, buttocks and back muscles. Position your hands on the floor with your arms straight and your thighs on top of the ball. Legs should be extended. Perform a push-up by bending your elbows to lower your body toward the floor and then slowly extend your elbows to push yourself up again. You can take short pauses in between. Breathe out while pushing and breathe in when returning to the starting position. This exercise strengthens spinal mobility and back muscles. Kneel behind and rest your trunk on the ball with your hands and feet on the floor to support your body. Allow your head and neck to relax. Breathe in and out, allowing your body to relax and mold over the ball. This exercise should be done in short periods of time on an empty stomach. This exercise stretches the spine and releases the neck’s muscles. It helps relax your mind and body. Note: Persons with poor balance should use the ball only under close supervision. 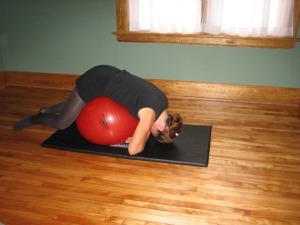 Today many people are incorporating Pilate’s fitness with the exercise ball. It is one of the most amazing ways you can strengthen and tone any part of your body. You can focus on anything from your posture, how you breathe, to getting a tight flat stomach. The most amazing book I have come across for properly learning ball exercises is called “Pilates on the Ball – The World’s Most Popular Workout Using the Exercise Ball” by Colleen Craig. This book has not only helped me in reducing my waist size and tone my whole body, it has helped me relieve neck and back pain. The trunk flexion, along with other suggested exercises in Colleen Craig's book, is a great tool for stress relief and deep breathing. All you need is an exercise ball and a little bit of free space in any room in your home. You can even enjoy these exercises in front of the T.V. or while listening to your favorite music.